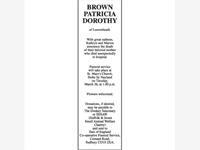 BROWN PATRICIA DOROTHY of Leavenheath. With great sadness, Kathryn and Marion announce the death of their beloved mother who died unexpectedly in hospital. 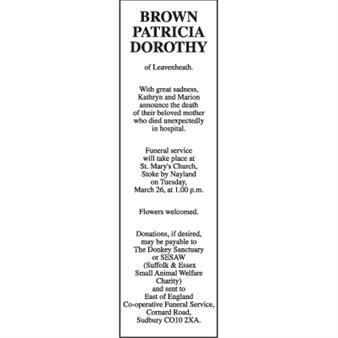 Funeral service will take place at St. Mary&apos;s Church, Stoke by Nayland on Tuesday, March 26, at 1.00 p.m. Flowers welcomed. Donations, if desired, may be payable to The Donkey Sanctuary or SESAW (Suffolk & Essex Small Animal Welfare Charity) and sent to East of England Co-operative Funeral Service, Cornard Road, Sudbury CO10 2XA.